I was just outside taking a break and a couple of the local squirrels were out in the yard. I love watching the squirrels, and all the other animals that find their way into our yard and the surrounding area. 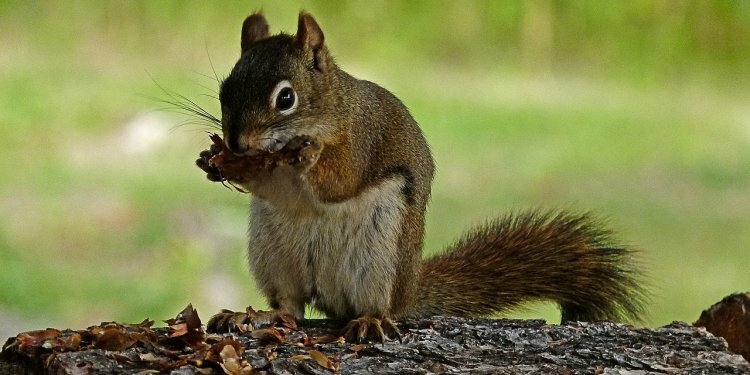 Squirrels can be really cute. I enjoy watching them bounce all over the yard like furry little springs. They just bounce, bounce, bounce! You can’t help but smile. Then they sit there, or cling to a tree, their fluffy little tails waving like mad flags. They’re so twitchy, I have to wonder how the heck they can move like that. They’re also cute when they’re finding nuts. We watched one going around, and it was very giggle-worthy. He’d bounce around scouring the grass. He’d find a nut and take a bite. If it was bad, he’d chuck it out of the way. If it was good, he’d grab it, run over to some other spot, then dig like crazy. He’d put the nut into the hole and bury it. it was adorable watching him furiously patting the ground in place over the nut with his little paws. Then he’d repeat the process. We’ve also got one that loves to take naps on a board that is nailed to the tree out back. I have no idea why the board is there, but it’s nailed horizontally across the tree. He’ll get up there with a nut, eat the nut, then nap. He stretches out so he’s got legs hanging off each side of the board and his belly along the edge. It’s so funny. He’ll sleep like that for quite a while too. Then he’ll stretch just as long as he can, go find a new nut, and repeat the process. I really do love watching the little animals around here. So many people miss out of the joy and wonder of nature. They’re so busy with whatever nonsense society is telling them is important today that they don’t see all the amazing things that they’re surrounded by. I highly recommend taking some time every day to nature watch. Even if all you can do is watch an ant on a railing, do that. Enjoy nature, and remember that the world is an amazing place.